With the help of Dr. Isabella Marin, a young expert in the enigmatic Voynich Manuscript and cryptophasia (twin language), Nicholas and Michaela home in on Roman Ardelean, a wealthy cybersecurity genius and a descendant of fifteenth-century Romanian Vlad the Impaler - often romanticised as Dracula. Ardelean believes the Voynich Manuscript will unlock the secret to curing his severely ill twin brother’s blood disorder and is willing to murder anyone who gets in his way, including Nicholas and Michaela. Michaela Caine and Nicholas Drummond are the super-star detectives of Catherine Coulter and J.T. Ellison's best selling "A Brit In The FBI" series. The fifth book, The Sixth Day, Drummond and Caine are enjoying a much-needed vacation when the world seems to go mad, as political officials begin to drop like flies...the German Vice Chancellor literally on the steps of 10 Downing Street. While the government declares the deaths are from natural causes, a blurry photo proves otherwise. Someone is using a drone to conduct targeted assassinations. Loaded with poison, tiny projectiles are fired at the unassuming victims. The Covert Eyes Team has to find out who may be next on this madman's list. This is where the author's shake things up! Swirling fact and fiction into a wholey intoxicating story that leads the team to an illustrated codex known as the Voynich manuscript. Carbon-dated to the fifteenth century, this handwritten document has been studied by professionals and amateur cryptographers with no definitive answers. Codebreakers have assembled 240 pages, with some 20 pages missing. Dr. Isabellla Marin not only knows the location of those pages, she's an expert in cryptophasia. With her assistance, Drummond and Caine narrow the focus of their investigation down to Roman Andrean. 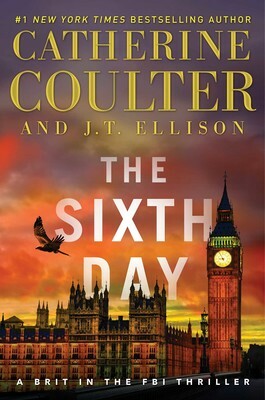 Blending fact with fiction Coulter and Ellison delivered an intelligent, modern, high action thriller that entertains from the first to the last page. The characters are not only presented well, they are "well thought-out." It's obvious the authors know their characters and have made plans for them in future books. Drummond and Caine are very different characters, but they work great together. They are easy to care about and I quickly became invested in what happened to them. I found myself dreading the end of the book because my time with these "people" would also end. The story moves amazingly fast for 500+ pages. You can feel the tension, but the story never feels rushed or cut off. Everything is followed to its respective end and resolved. Whether it be the way you hoped or not is for you to decide. There's so much to enjoy about this book - just make sure you have a block of free time before you start reading...it really is hard to put down.